Virtually all healthcare organizations struggle with maintaining an appropriate balance of available staff to care for their patients. Staffing too many nurses puts financial integrity at risk, and by staffing too few the quality of care can be negatively impacted (not to mention nurse satisfaction). 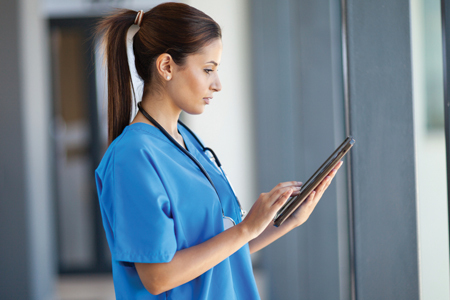 While technology is not a panacea for nurse staffing challenges, it does have the potential to play a significant role in the way hospitals ensure they strike the best balance so that patients always come first and receive the best possible care. Hiring the right nurse to begin with, giving them control over their work environment, and providing them with visibility into opportunities for growth and change are three salient ways to ensure a sustainable nursing workforce. According to the ANA, there will be more registered nurse jobs through 2022 — in excess of 100,000 a year — than any other profession. It is basic supply and demand, with fewer nurses available to fill existing vacancies, which results in hiring decisions based on necessity versus quality. More healthcare organizations are turning to predictive analytics tools – including assessment technologies that measure the cognitive, cultural and behavioral characteristics of individuals – to determine how well nurses fit the culture of the organization. These tools also look at which nursing area, such as emergency department or ICU, best suits each nurse. This technology has proven to reduce turnover by matching nurses with the perfect role for them, improve diversity by mitigating bias in the hiring process, and even impact patient satisfaction (happy nurses result in a better patient experience). A survey conducted in 2017 reports that of nurses surveyed, 63 percent report that their work has caused them to feel burned out. One of the most significant contributors to nurse satisfaction is their perceived control over their work environment — particularly their schedule and patient assignments. Healthcare organizations are moving away from paper-based mechanisms in favor of web-based mobile platforms that allow them to adapt based on changing census, acuity (workload associated with specific patient needs) and the need for flexibility when staff are unable to work their scheduled shifts. These systems allow nurses to have visibility into the schedule on their mobile devices, where they can automatically receive text notifications regarding the constantly changing availability of shifts. Nurses can pull out their phone and swap shifts with a co-worker in the same amount of time it takes for them to check their bank account. The ability to connect to the EMR allows these systems to leverage clinical data in determining the number of nurses needed for each shift, and the equitable distribution of assignments based on the workload associated with specific diagnosis-related groups. An embedded methodology within the technology enables nurse managers to justify staffing decisions and workforce-related investments. Nearly 20 percent of nurses leave the profession entirely during their first year; another one in three is gone within two years, according to the Robert Wood Johnson Foundation. This stat suggests that not only are nurses leaving the profession entirely, but the days of nurses working for one organization in the same unit for the entirety of their career are over. The next generation fully expects to change roles (and even careers) several times over the course of their working life. Their ability to see what their next step looks like can be the difference in retaining their institutional knowledge for four years instead of two. The annual, retroactive performance appraisal, for example, is antiquated. Today’s nurse managers need to create, deliver and report on employee learning throughout their career. There should be multiple touch points throughout employment. This includes in-the-moment feedback and accelerating the rate at which nurses can find ways to achieve their full potential. Studies have shown this to be a key retention strategy, especially for millennials. By placing the right nurses in the role best suited for them, offering more control over schedules and work environment, and opening up possibilities for growth, we will begin to address the biggest challenges with nurse staffing — and get back to focusing on providing the best possible patient care.